The mill is located on the south-west side of Koufonisi. Koufonisi is located south-east of Naxos and west of Amorgos in the center of the Aegean sea. Koufonisi is probably one of the smallest islands of the Cyclades with its extend of approx. 4 km2 and its 300 permanent residents. However, it has many things to offer such as its slow pace, fresh fish and beautiful beaches. Chora is the island's only settlement and it is built on the south-western side directly above the harbor. There you will find taverns, a few shops, two super markets and two bars. 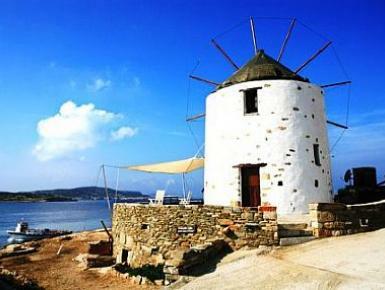 The mill has a unique view over Naxos, Kato Koufonisi, Glaronisi, Keros and on the far horizon one can see the outlines of Amorgos. On the paved courtyard you will enjoy carefree hours and unforgettable sunsets!